Jade Sea Journeys, is the only northern Kenya tailor made safari specialist. It originated from a tour operator named Hiking and Cycling which was founded by Halewijn and Joyce Scheuerman at the start of the nineties. They became rapidly the Lake Turkana safari specialist and naturally created Jade Sea Journeys ltd, which had a precious number of tour safaris and packages. The mystic call of the largely unknown and explored Northwestern Kenyan Turkana and Omo River basin had a magnetic call on both Joyce and Halewijn. 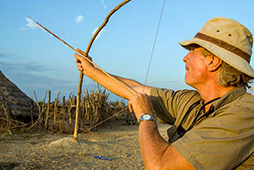 Predictably, Jade Sea Journeys was soon the specialist tour operators for safaris on and around Lake Turkana. And also into the lower Omo river basin wilderness, where Halewijn established Lumale camp which was the hub for exploration of wilderness tribes and cultures. An this enthusiastic couple settled a Turkana luxury camp on the west shores of the lake : Lobolo Camp. As Lake Turkana safaris specialist, our team at Jade Sea Journeys works hard to attain our mission and promise to offer unparalleled attention to you our client. We are inspired and innovative at delivering a unique safari experience, especially when in our speciality, of trips on and around Lake Turkana, within The Northern Kenya and beyond. With more than 25 years of safaris organization in these remote and amazing areas, our team can safely guiding you. Halewijn was the first tour-operator to really settle Lake Turkana safari operations with boats and safaris trucks. He explored every corner of the Lake Turkana and the low Omo river basin. This Man of many of disciplines, scholar, explorer, guide and anthropologist to name a few, was well captured by Alison M. Jones, Founding Director of No Water No Life. Please read her 2007 interview with Halewijn Click here ! Joyce, an experienced traveller, is one of the founder of this Lake Turkana safaris specialist. She have been working in the safari industry for more than 30 years. She has a wealth of experience in tour guiding, management and marketing. Born and raised in Kenya her passion and comprehension of tour operations equipped her to meet the various demands of clients and operators alike. She is the pillar behind the smooth running of the office. Her knowledge of travels in the region of the Turkana basin is exceptional. She loves guiding and hosting clientele in Lobolo camp and the Lake Turkana area. Njogu is a graduate of science and he has been in the tour industry for over thirty years. He is a real Lake Turkana safari specialist. He was from a young age fascinated with nature and the rural country side was his play ground. His knowledge about flora and fauna is remarkable, not surprising that he literally has read, watched and continues to follow National Geographic avidly. Second to this is his technical knack and know-how and often operates in the back ground designing, building and maintaining. Njogu is witty and keeps one engaged with anecdotes of his decades of experience.